Three-dimensional tassels hang beside a pair of two-dimensional brocaded tassels on this sparkling evening dress. 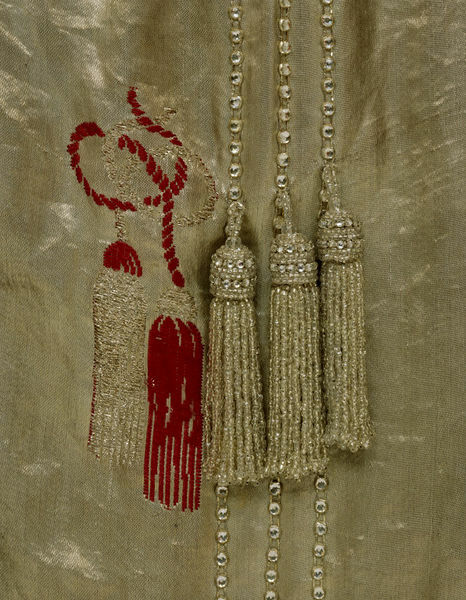 Tassels were an extremely popular decorative motif at the time. Here the designer has wittily juxtaposed a trompe-l'oeil image with real tassels. Mrs Pearson wore this lavish gown for her 1922 portrait. She ordered it from Reville and Rossiter, a London couture house appointed court dressmaker to Queen Mary. Two buyers from Jay's department store founded it in 1906. Miss Rossiter was in charge of administration and Mr William Reville was the designer. Once it gained the royal warrant in 1910, it was almost automatically patronised by leading London society. In 1911 Reville and Rossiter designed the queen's coronation robe. By the end of the 1920s the firm had gone into decline and in the late 1930s merged with Busvine. Evening dress made from silver lamé with a woven pattern of silver and red tassels. The dress is ankle length with a swathed, sleeveless cross-over bodice. The skirt is slightly gathered onto the waist-band and is ankle length, hanging longer at the back. Slit up slightly at each side and in a straight panel at the front. There are bands of paste embroidery around the neck and arm-holes and paste tassel trims at the shoulders. 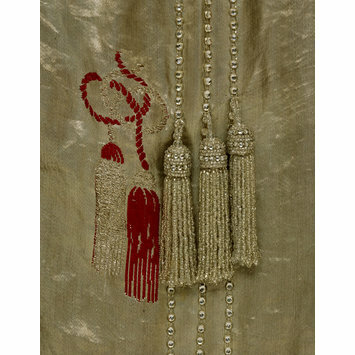 At the back, on either side, are vertical triple bands of pastes trimmed at hip and hem with three-dimensional sparkling, pendant tassels with fringes of tiny silvered glass beads that hang beside a pair of two-dimensional, brocaded tassels. The bodice lining is of chiffon, the skirt lining of silk gathered on to elastic at the front. The maker's name 'Reville and Rossiter', is stitched to the wide, petersham waistband along with a name tape with 'Mrs H. Pearson'. On name tape, stitched to waistband. Evening Dress, Reville and Rossiter, England, 1919.